I sometimes forget that foods I’ve grown up with and consider typical are unfamiliar to others. Such is the case with the fishball. The fishball is much like our beloved meatball except, as the name implies, it is made with fish. Savory yet mild, I’d recommend giving it a chance if you haven’t already. A few years ago, I discovered the Fuzhou fishball, which is stuffed with pork. Meat stuffed with meat? Sign me up! There are only a few places in Chinatown that serve it, and I am determined to try them all. First up was Super Taste – with a name like that, expectations are high. But how did its Fuzhou fishball measure up? Super Taste is located in the non-touristy area of Chinatown – that is, pass Canal Street Chinatown, go under the overpass, keep walking, and THEN you’re there. The restaurant features hand-pulled noodles, stewed meats, and other Fuzhou delights, but I was here on a mission – how did its fish balls in broth measure up? 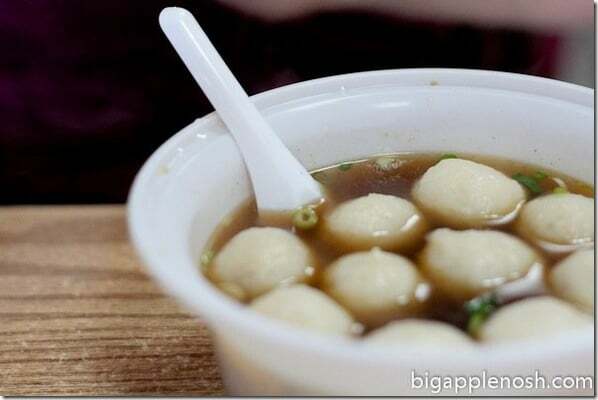 For $3, you get 10 golf ball sized fish balls in a savory beef broth (you can add noodles for extra). The fishballs were light and fluffy, with juicy pork meat hidden within. The broth was better than most, with a rich beefy flavor. For $3, this dish really can’t be beat. Super Taste isn’t the most convenient restaurant to get to, and you can grab one of it’s 3 tables if you’re lucky. The wait staff, consisting of one woman, can be a bit gruff; however, if you’re willing to forego some ambience for a cheap and savory meal, I’d recommend Super Taste. A little out of the way, but worth it for the price. 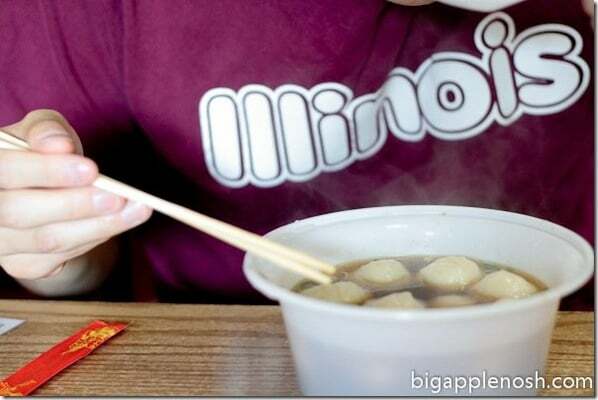 Have you experienced the mighty fishball? I LOVE fuzhou fish balls (and have found them in supermarkets in London and Singapore!) The non-touristy part of Chinatown definitely has good food! those cheap plastic bowls are definitely a sign of non-touristy chinatown! i love that you explore far and wide–so fun to hear about! Aaahhh..something else in Chinatown to try! yum. I love fish ball soup. YUM. I would probably try the pork stuffed first, before the traditional fishball. Nom. Pig.